If you’ve used any of Readdle’s products, then you’re probably familiar with the level of polish that it normally achieves. PDF Converter, an iPad app that lets you grab documents, text or webpages and turn them into nicely formatted PDFs, is no exception. 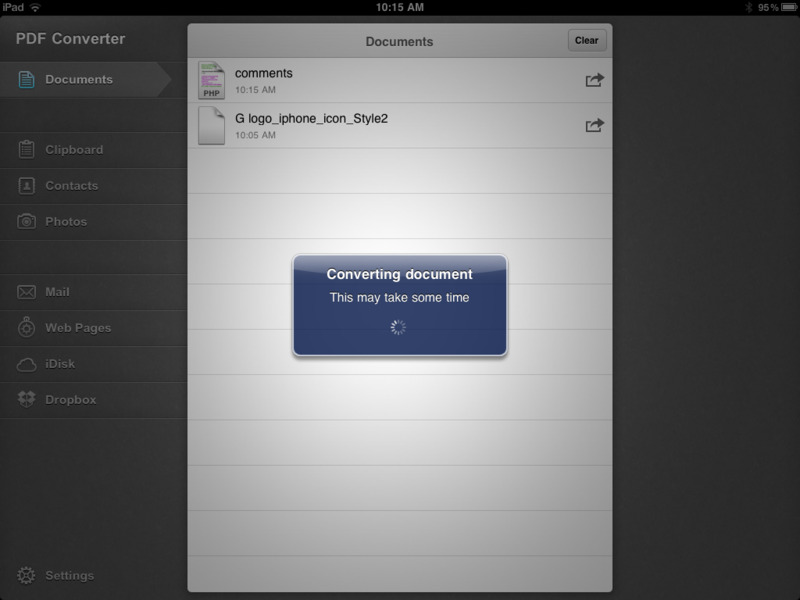 PDF Converter [App Store, $6.99] is a very simple app that acts as a funnel. You toss other formats of document into it and it parses and converts them, spitting out a PDF that you can then send on to another app or person. 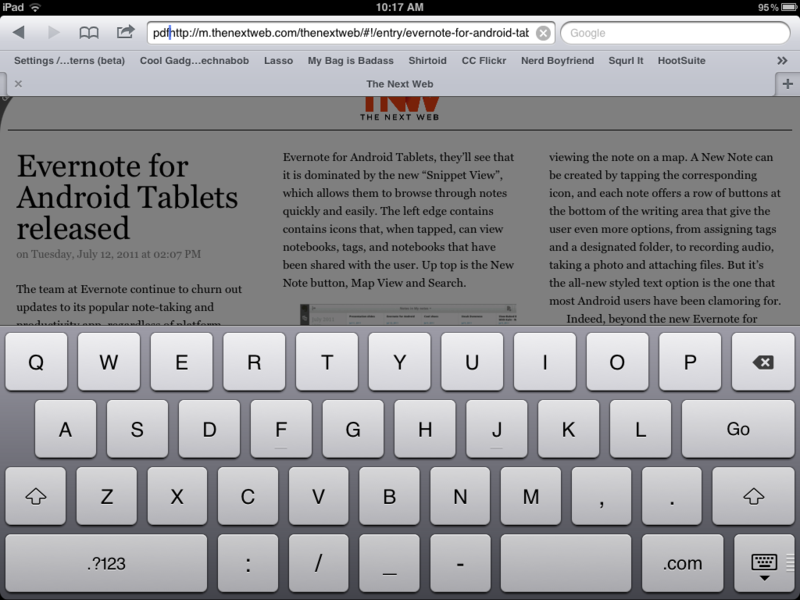 It’s a concept that other apps have tried to emulate, but that none have one in as clean and simple a way as Readdle. One of the best things about PDF Converter is that it doesn’t try to do too much. You won’t be browsing your PDF library or filling out forms, Readdle has apps for that already. Instead, you just use the ‘Open in…’ option that’s found in the sharing button of most iOS apps to send a document to PDF converter, it automatically opens and converts the document, then presents you with a clean preview of the results. 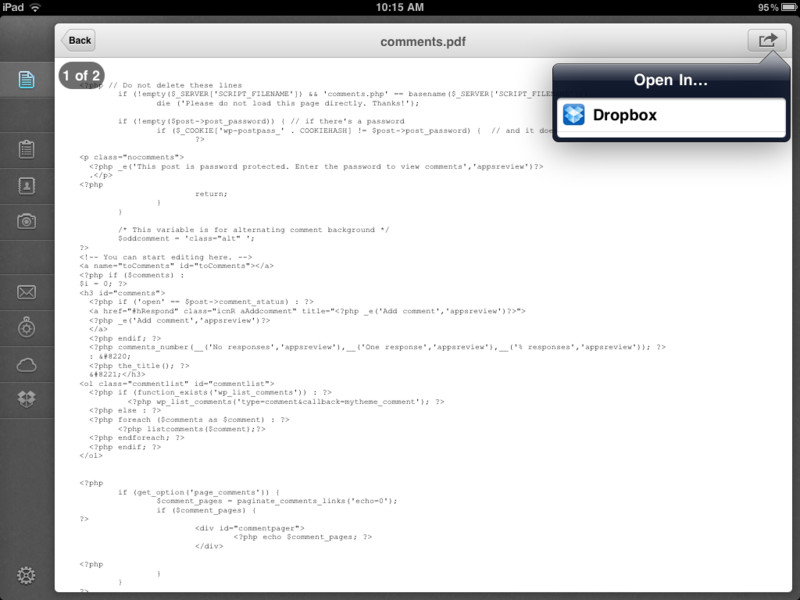 You can then use the same sharing button to send that document on to another app. I’ve tested it with a variety of documents, but the two use-cases I’ve found to be the best example of why you’d use PDF converter are Dropbox and web clippings. Because Dropbox is the center of my shared document workflow, pretty much every strange format of file ends up in there. Sharing those files between machines or people often becomes an excursive in frustration because the recipient, or more accurately, their computer, doesn’t have the right programs installed to open them up. Now, I just shovel a quirky Word 97 doc through Readdle and it folds it up into a nice PDF that can be sent on without fear of issues. The same goes for sharing pages from a website whole. Sometimes a link is the most practical way of doing this, but if you’re preparing a section of a webpage for a meeting handout or you’re a teacher wanting to distribute a page in its complete form, it can be better to save it as a complete file. PDF Converter has a clever mechanism to do this, just add ‘pdf’ to the beginning of any URL and it will automatically send it to the app. The page will get converted and you’re on your way. The UI is especially sparse and clean, which is great for a utility app. Apps like this should show some restraint with design, doing away with crazy, if good looking, amounts of chrome that just slow down load and animation times. PDF Converter does this with a simple sidebar and a very subtle textured finish. Every action you take while inside the app feels clean and crisp. If I was to say one thing about it its that the four ‘helper’ options on the left that instruct you how to convert PDFs from email, web, iDisk and Dropbox could have been perhaps collapsed into a single help or how-to menu. But the space is there and I can see that it is nice to have a quick reference for users that forget the procedure for these various methods. If you have any sort of need to convert PDFs and you don’t have a method that feels light, fast and enjoyable already, then you owe it to yourself to check out PDF Converter. As with most of Readdle’s offerings, you’re getting a quality, well designed app that makes your life just a little bit easier. Shouldn’t this always be the case?